« Neighborhood Shoppers Are “Outside Interests,” but Cut-Through Drivers Are Not? This is what we’re up against. 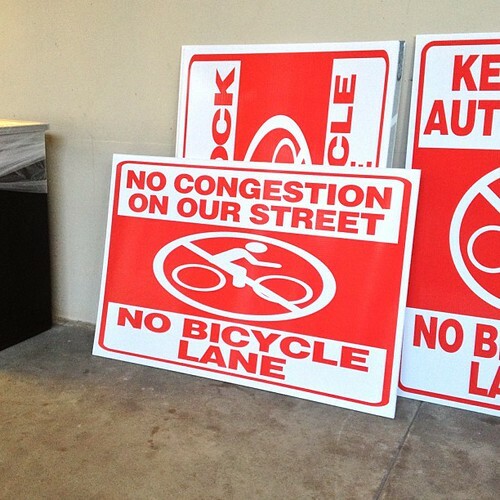 The ugliest backlash I’ve ever seen in LA against bike lanes. Do you ever want to ride a bike on North Figueroa Street in a buffered bike lane? 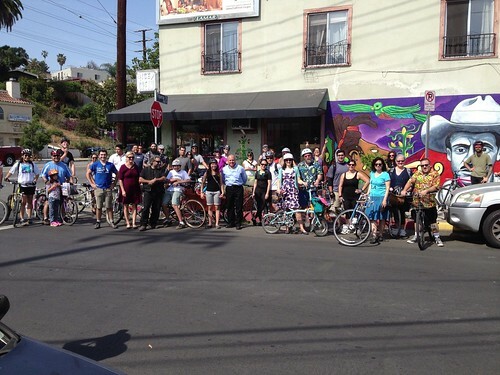 The LADOT has plans to install a 5-foot wide bike lane on North Figueroa Street this year – but those plans may be put on hold if the Arroyo Seco Neighborhood Council and the Greater Cypress Park Neighborhood Council decide to write letters of opposition to city about the project. That is where you come in: attend a couple of meetings tonight and tomorrow evening and show the neighborhood councils (NC’s) that local people in support of the bike lanes outnumber those opposed to the lanes. Come to the meeting and make a public comment, submit a written comment, and be entertained with bombastic anti-bike comments from those opposed to the bike lanes. A group of locals (aka “Band of Outsiders”) gathered to ride in support of bike lanes. We think these lanes are a great idea. At the cost of little bit of added motorist delay during rush hour the neighborhood will get a measurably safer street for all road users. It will make biking and walking more pleasant. It will help return the N. Figueroa corridor to its street cars suburb atmosphere – the type of street our houses an businesses are designed to serve. Plus, riding bikes is fun and a great way to stave off the diseases of a sedentary lifestyle that plague our communities. Arroyo Seco Neighborhood Council meeting is on Monday, May 20, 2013 at 7 p.m. at Ramona Hall, 4580 N Figueroa St., Los Angeles, CA 90065. There is a Facebook Event for this meeting. Greater Cypress Park Neighborhood Council meeting is on Tuesday, May 21, 2013 at 7 p.m. at the Cypress Park Recreation Center, 2630 Pepper Ave., Los Angeles, CA 90065. There is a Facebook Event for this meeting The GCPNC has just announced that they are rescheduling their meeting because a local election is taking place tonight and they didn’t plan ahead. Grrr. If you cannot attend the meetings, you can send in your comments via email. Contact the GCPNC by emailing them at Cypressparknc12@gmail.com. You can also hit them up on Twitter at @CypressParkNC. Our shop, and others, have been using the hashtag #fig4all on Instagram, Twitter, and Flickr. You can follow live tweets and images from the event by using that hashtag on those social media services.